Has anyone who has done the RC-51/SP-2 fork installation had a problem with the fender hitting the oil cooler? I made a post on "the other site" just to assemble as much info about my project as possible. Had a guy remark that he's heard that can be an issue. BTW, my RC-51 factory manual came in yesterday. 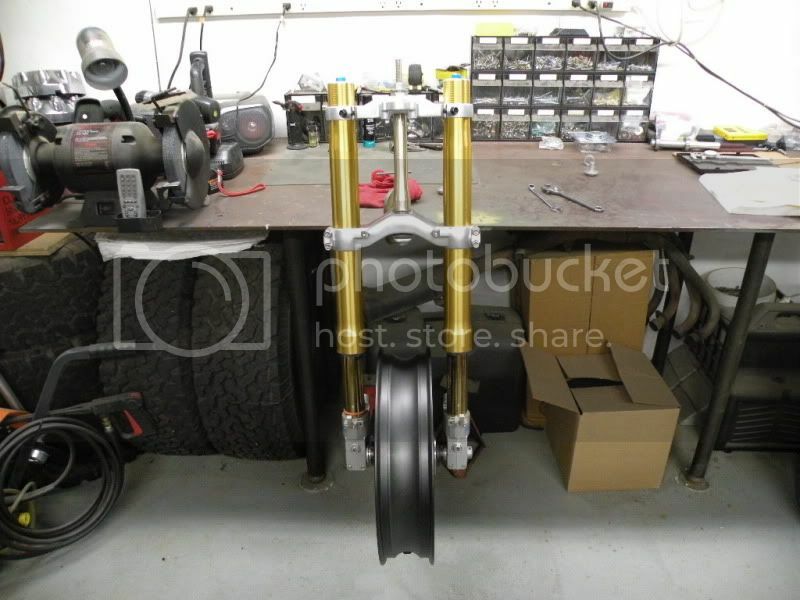 Not cheap, but now I know all of the relevant torque specs and know what the insides of the forks look like. Which upper triple are you using again? No problem with the fender and triple and I've landed some pretty hairy :biggrin: with the RC51 front end, never an issue. I wish you'd said you were after a manual as I have a pdf one of the SP1 Honda Service manual I found ages ago, could've sent it to you. It's a slow moving project. Money is a little tight right now so I proceed as the extra coins become available. Has anyone who has done the RC-51/SP-2 fork installation had a problem with the fender hitting the oil cooler? Only applies to the VFR750 model. A couple of guys with those have either curved or re-located their oil cooler for clearance. I have used CBR929/954 upper and lower triples, and the RC51 lower triple and had my forks flush with the top triple, 30mm above and 15mm above and it has all been good for me. Haven't crashed, tucked the front, ran wide on the exit of a corner, worn my tires irregularly, pinched my hands or fingers between the tank and bars, bottomed out the forks or hit the fender/wheel/forks on anything or any other matter that people who have not done this will tell you to watch out for. For the VFR800 models at least, it just works. In the process of collecting parts for my sp2 fork install on my 03. So far have the legs and 929/954 upper triple. People want alot of money for the sp1 lower, will the 929/954 lower work just fine? I've used both. Uses the same lower bearing as the SP-1 does. OK, duh here. I THOUGHT the SP2 spindle WOULD NOT fit a VFR, needed SP1. AM I wrong? Not that its that important, just info. Stem diameter is too large, will not fit the VFR's frame neck. However, using the SP1 triple allows you to use SP2 forks if you wish. Center to center distance is the same, as is the clamp diameter. I originally looked for an SP-1 triple clamp over on the RC-51 forum. One guy wanted $180 for one and sent me a cell phone pic and it looked like crap. Another guy wouldn't even quote me a price, he just said "Make me an offer" - that's with no pics or no description. I can tell you some real EBay/RC-51 forum horror stories about this undertaking. I've got the essentials together. From here on out, it will be all new parts. My front end came with a 929/954 stem and I'm determined I'm going to make it work one way or another. The biggest appeal to me of using a 929/954 steering stem is it uses the same All Balls bearings as the VFR and it looks like the steering stops might work OK as is - no sawing off and having to install bolts. With work picking up real strong here lately, the weekend is the only time I get to mess with the VFR. I am interested to know if the steering stops work with the 929/954 lower. Please update when you get it together! On the 3mm spacer for the lower bearing. Think it would work best between the lower bearing race and the frame. Not between the triple and the bearing. This way, the lower seal is in the correct position. I am interested to know if the steering stops work with the 929/954 lower. I just ground mine off and left it at that, but I consider steering locks pretty useless anyway. The biggest appeal to me of using a 929/954 steering stem is it uses the same All Balls bearings as the VFR. Lower bearing is CBR929/954 or 2000-2001 RC51 SP-1 which are interchangeable. Sweet! :fing02: Keep us up to speed on the rest of the hardware as you get it.... -- What wheel is that? Sweet! :rolleyes: Keep us up to speed on the rest of the hardware as you get it.... -- What wheel is that? Sweet! :biggrin: Keep us up to speed on the rest of the hardware as you get it.... -- What wheel is that? 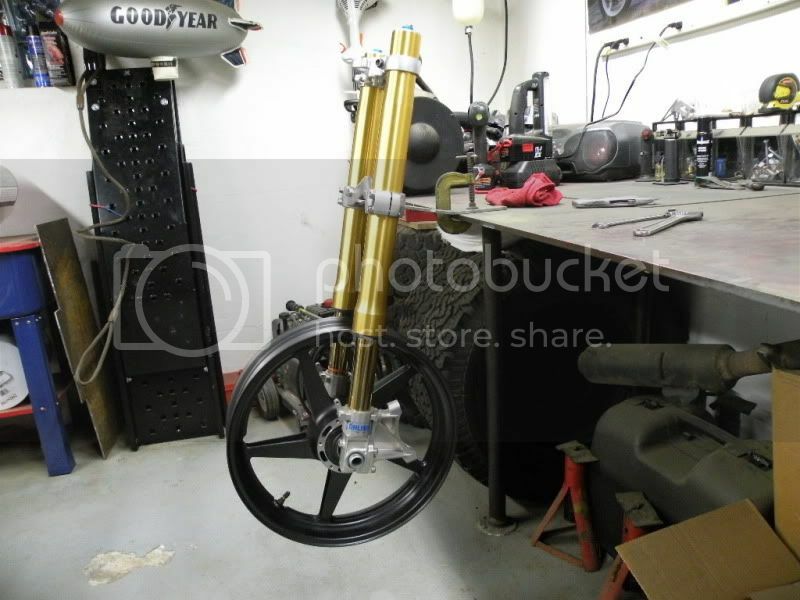 looks like an SP2 wheel to me... at least it looks like the one on my bike.